Iftikhar Muhammad Chaudry, Chief Justice of Pakistan Supreme Court - Pakistan "The Land of Pure"
Chief Justice of Pakistan Supreme Court Iftikhar Muhammad Chaudry was born on 12 December 1948 in Quetta. He joined legal profession as an advocate in 1974 and enrolled as advocate High Court in year 1976. 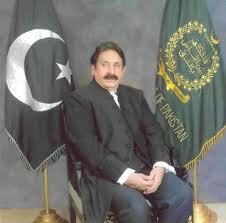 He became the advocate of Supreme Court of Pakistan in 1985. He was expert in the fields of civil, criminal, constitutional and revenue laws. In year 1989 he was appointed as Advocate General Balochistan and additional judge High Court of Balochista in year 1990. In 1993 he became permanent judge in Balochistan High Court and became Chief Justice of Balochistan High Court in 1999. In 2000 he was appointed as judge of Supreme Court of Pakistan and finally on 30th June 2005 he became the Chief Justice of Supreme Court. • Besides functioning as Judge High Court of Balochistan, Quetta discharged duties as Banking Judge Special Court for Speedy Trials, Judge Customs Appellate Court as well as Company Judge. • Iftikhar Muhammad Chaudry Was appointed as Judge In charge Supreme Court Staff Welfare Committee by the Hon’ble Chief Justice. Iftikhar Muhammad Chaudry received Medal of Freedom from Harvard Law School. In 2007 National Law Journal of United States honoured him as lawyer of the year for 2007. on 17 November 2008 he was given honorary membership in New York City Bar. Iftikhar Muhammad Chaurdy is the most celebrated Judge in history of Pakistan due to his struggle against Dictator General Musharraf. He will be retired in 2013. The most corrupt and porphyritic judge in the history of Pakistan. his son was illegally appointed in police. and due to his decision on Pakistan steel mill, Pakistan steel mills is now suffering and is a burden on Pakistan’s economy. we wish that he retire before the end of 2011. 1st of all ALLAH gives same qualityes(MTERIAL) to everyone . or sabh se khatarnak cheez insan ki ZABAN hay. or ishi ki wajha se insan ezzat kamyabi pata hay or yeh zaban hi insan ko 2 JAHANON se rad bhi ho jata hay.so matla yeh howa k isska istmal sochne k bad samajh ker hi karein to ALLAH or uski makhloqat pasand fermati hain. 2ndly aap kisi ki zatti haseyat per kisi had tak bat karo to shayed aapke saray dost bura mat many,magar kisi k OUHDAY per kasay kuch keh sakhtay ho,OUDHA jo bhi hayapni jagha per hi rehta hay.usper faiz honay waly badalte rehtay hain . or aapne iswaqt us OHDAY per faiz jis hasti k baray main bat ki hay Aun ki emandari or suchai KA IMTEHAN ALLAH TALLHA LE CHUKE HAIN.AAP COURT MAIN JO CHAHY BOLO AAPKI BAT PER ACTION HO GA.BUT LOGON KO GUMRAH NA KAROO OR US BATOON PER JO AAPKO KHUDH BHI NA PATA HOON. He is disputed judge because political involvement and unfair his son appointment he is the person who is in politics Hippocratic, before in Pakistan nobody knows name of Chief Justice now he is a figure of Pakistan. I think he is having in his mind that he will participate in Pakistan politics in future. A PERSON OF DEMOCRACY AND HUMAN RIGHTS WOULD LIKE CALL “CALL FOR MARTIAL LAW” A CONTEMPT OF DEMOCRACY AND PARLIAMENT. COMPUTER OPERATER BPS-10 DISABLE PERSON. Sir I am working Agriculture Market Committee Deptt, Nawabshah sir 13 months not paid my salary because my salary is recovery fund any time my dept. is not afford my salary sir may Allah help you from each and every corner of life and up life your prosperity to do some thing in fever of disable persons specially for me on above request Sir my help is humanitarian ground I am is poor man my family members 9 nine I am disable man and my son and daughter is very 2 to 6 years age alz help me order to your higher authorities my cadre change and deptt. loose by granting amnesty to the hapless prisoner and depatching him home. as a wrong-doer only who again is a human being and not just a native musalman or a hindu from an enemy country.Sir, i beg your bounty and large heartedness to heed appeals and prayers of crores of indians and release him from jail if he survives the recent bid on his life in kot lakhpat jail & book him home as early as possible. Regards.Er B.Malhotra .Delhi-India.